The size of the test patches will depend on the subject matter, but as a guide, they should be from 75 x 75mm up to 300 x 300mm. Apply Peelaway paste graded from 1mm to 6mm thick according to the age and thickness of the coating (e.g 1mm when removing a thin layer of varnish but possibly up to 6mm where there are multiple layers of thick paint). Place the Peelaway blanket (print side out) on to the paste. Rub gently to remove air, pierce bubbles where necessary. Allow to stand from 2 to 48 hours, again this will be determined by the paint/coating type and thickness/number of layers. For areas involving different elevations, several test patches should be applied to accommodate the possibility of different coatings and the effects of weather on exterior surfaces. To remove, the spatula should be inserted into the paste and a section gently lifted away. If the original surface is apparent, the test patch can be removed and the surface wiped with a damp sponge. If paint can still be seen, the test patch should be replaced and re-examined after a few hours. Once the correct paste and timing for the project have been established together with the thickness required, the designated paste should be applied, the Peelaway® blanket laid over the paste and left for the time indicated by the test patch. Full instructions are on the containers. 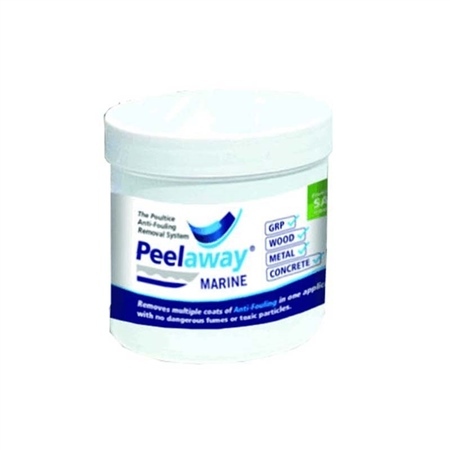 Peelaway Marine is specially formulated to effectively remove multiple layers of anti-foul coatings with one application. Saves time by reducing the need for repeated scraping. A light paste consistency and is easy to apply to vertical surfaces and difficult shapes. Can be applied with a brush or towel and for larger areas, an airless sprayer can be used.